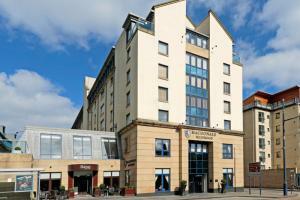 This hotel is the perfect place to relax after the excitement and fun of Edinburgh. 157 elegant guest rooms surround you with comfort and calm in the heart of the city. Pamper yourself at the luxurious spa, enjoy a meal amid beautiful surroundings at Bistro Deluxe or sample a cocktail at the stylish bar. This hotel is the ideal base for exploring this fascinating and unique city. The famous Royal Mile is just a short walk from the hotel. Arthur’s Seat, Edinburgh Playhouse Theatre, University of Edinburgh, Princes Street Gardens, St. Giles’ Cathedral are all less than a 20 minute walk from the hotel.